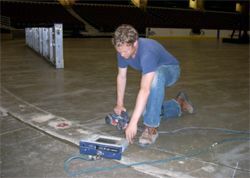 KGE Arena Seating Company needed to drill through concrete floor of the ice rink at Quicken Loans Arena in Cleveland, so they first called GPRS, LLC. KGE knew that there were pipes containing glycol embedded in the concrete. Instead of risking drilling through one of these pipes and disrupting the glycol pipe network, KGE first called GPRS to map out the pipes. 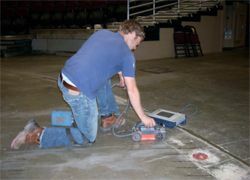 Ground Penetrating Radar was able to map out the precise locations of each pipe and mark the locations directly onto the concrete surface at the time of the scanning. We were also able to identify the end of each loop of pipe and where they made each 180 degree turn. KGE was then able to confidently drill each anchor through the concrete.